Nazca is approximately 400 kilometers south of the Peruvian capital of Lima. 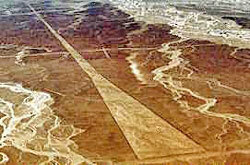 It is home to enigmatic lines, some measuring 8 kilometers in length, with one line even continuing for 65 kilometers. Situated in an area where it virtually never rains – a few drops per year on average – the lines have been impressively preserved since they were created almost 2000 years ago, by removing the top soil, thus revealing the white soil underneath – and thus the “white lines of Nazca”. These lines appear over an area that covers 500 square kilometers and come in various forms and shapes; apart from lines, there are also depictions of animals, including an ape, a whale, a snake, a lama, a human being, a flower, etc. But the most prominent features are the lines, etched here over a period of one millennium, from 500 BC to 500 AD. The complex and the designs are so vast that little can be seen from ground level. 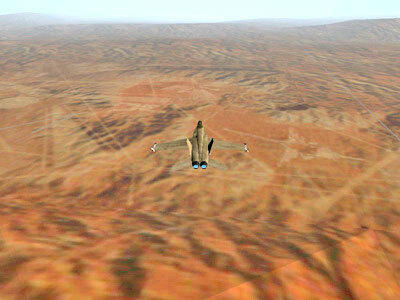 Small portions are visible, but the entire scope of the “Nazca lines” is only visible from the air. The logical question is therefore why this complex was constructed when it was invisible – and the people who created it had not yet discovered flight. It was this quagmire that von Däniken turned upside down, suggesting those who constructed the complex did know the secret of flight. He also underlined the straightness of the lines: over a distance of 1500 meters, the lines never deviate more than 4 meters. From this, he observed that the complex looked similar to the design of modern airports – could the Nazca lines be an airport for the extraterrestrial deities? Rather than answer the question with a stern “no”, scientists preferred to laugh at the mere suggestion. In their favor, they were aware that the ground itself was very uneven and rough, which would mean that any plane trying to land there, would immediately have a severe accident during landing. Though it looked like an airport, an airport it was not. The local tourist industry had other priorities: owners of local airplanes were soon joined by many others who offered tourists the possibility to make an “aborted landing” on the lines (i.e. the pilots prepare for a landing as if the lines are the airport and just before the landing, the plane pulls up again). Though von Däniken had thus popularized the lines, they were not unknown before his arrival. Maria Reiche was a German mathematician, with an interest in the lines since shortly after World War II; since the 1950s, she had lived near the lines, in an effort to understand what they meant. For many years, she tried to bring the lines to the attention of the scientific community. Though she would largely fail, where von Däniken would succeed, in retrospect, both are now considered to be pivotal in the public awareness of the lines. Reiche believed that the lines had an astronomical function. The lines were there to determine the position of the stars. Unfortunately, a subsequent scientific analysis of her theory proved it incorrect; though some lines were indeed marking astronomical features, this correspondence was nothing out of the normal odds: there are a large number of stars and a large number of lines, and hence some should be aligned to some stars – by accident. Until her death in 1998, Reichenevertheless continued to defend her theory as best as she could. But her biggest pre-occupation was the conservation of the lines. She knew that every touch to the ground, even a normal stroll through the area, left marks in the surface that remained visible for many years afterwards. Reiche was therefore appalled to find that the lines had become a tourist destination – in sharp contrast with the local people who looked towards the tourists a new source of desperately needed income. The “aborted landings” of the pilots made her shiver, fearing one day, a plane would crash and destroy some of the lines. For most of her life, she also found that the local authorities were not interested in the lines and throughout her life, she fought to make the lines a listed national monument. In the end, her struggle proved successful. But her theory as to what the lines were was incorrect. And von Däniken’s theory of an airstrip was equally impossible. The problem is simple: if a plane ever did land on the lines, somehow able to land on the rough terrain, the sheer displacement of air would result in the lines being “blown off”: the top soil would once again cover the scraped off areas, and the white lines of the soil underneath would disappear. In 1995, von Däniken returned to the area and asked the pilot to search for more designs, which so far had not received any proper attention. Rather than try to prove his earlier speculation, he now hoped to show the vastness and complexity of the designs, which included geometric patterns which he, or anyone else, could explain. Tony Morrison had made extensive expeditions in the region and knew the theories of von Däniken, Reiche and many others. He soon realized that most researchers were too focused on their own research; all also paid too much attention on the lines, and not the features that were on, along and near the lines. Morrison also spoke to the local people, who had retained stories of how their distant ancestors had constructed the lines. He learned that certain sections of the network continued to be used by the local people for religious purposes. 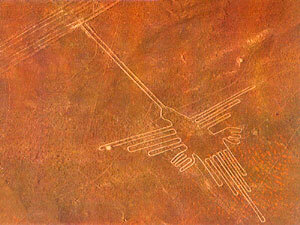 Perhaps this could be the key to unlock the mystery of the Nazca lines? Morrison theorized that the network was a type of cemetery. The desert area, where nothing could live, where no rain fell, was a delineated area used by the local people to contact their ancestors. This should not have come as a surprise, if we also know that the local cultures were in origin shamanic. Shamanic cultures use “shamans” (priests) to seek contact with the gods, the ancestors, the dead. These are local in a different dimension; they are not physical beings, but “spiritual entities”, often the souls of the tribal ancestors, as well as creator deities. The land of the dead was similar to Earth, but was found in another dimension – here, yet invisible to our eyes. Morrison felt that the clue to the Nazca lines was to be found here: the lines were an ingenious system that aided the shaman in his “voyage of the soul”. He argued that the lines often converged in certain nodes, from which they continued. On these nodes and at regular intervals along the lines, small altars could be found, sometimes little more than a small heap of stones and earth. Morrison, and later Paul Devereux, remarked that the most important aspect of the lines had not been sufficiently focused upon. The lines were straight. Straight lines were specifically linked with the voyage of the shaman in the Otherworld, as well as with the Otherworld in general. Souls were said to be only able to travel in straight lines. “Dead roads”, “dead straight roads”, often linked the church with the cemetery – if some distance separated them. 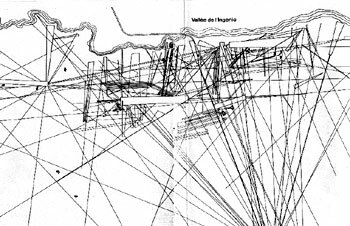 Devereux has developed this concept and argues that it underpins the concept of ley-lines: certain alignments in the landscape that form straight lines. Devereux is very familiar with the concept of those lines and argues that after many years of research in trying to prove they were “energy lines”, he realized their true meaning, particularly when he was confronted with a series of evidence from Western Europe that showed that the concept of straight roads survived in folklore. However, Devereux believed that as it was shamanic in origin, it also went back to the earliest religious notions of our ancestors – and thus would be a global phenomenon. Though this seems to explain the straight lines, what to make of the accompanying figures of animals and other forms and shapes? It is believed that these animals predate the lines. Their size is often massive, one figure measuring 275 meters. Remains of animal sacrifice were sometimes found next to these animals. She argued that the animal depictions were magical protectors – charms – for the shamans. They also acted as boundaries, so that shamans of other tribes would not intervene in a certain territory. Archaeologist Evan Haddingham continued this research and learnt that similar practices continue to be observed by the local people to this very day. Von Däniken was right when he suggested that the animals and lines had to be seen from the sky. They were seen during the shamanic flight, on his voyage to the Otherworld. Shamanic theory states that the shaman leaves his body and “floats” or “soars” through the sky, where often the eagle or another animal is his totem animal – the animal mimics or symbolizes the flight of the soul. If these lines were an airstrip, they were an airstrip for the soul – to take off to and return from the Otherworld. Dobkin de Rios agrees with this conclusion. She notes that the design of the Nazca lines is also found on pottery and other objects of the Nazca civilization; they often depicted the return of a god. But rather than an extraterrestrial being, she argues that it is the return of the shaman from his sacred duty, the soul voyage. She also identified the cactus “San Pedro” (Trichocereus pachanoi) as the plant that induced the shaman’s vision. The plant was also depicted on various pots and even on ancient temples.